Two years and a change in lineup, label and location preceded the follow-up to their critically acclaimed first full-length, A Conscience Left to Struggle with Pockets Full of Rust. Now on Victory Records as a trio (second guitarist Micah Garlich-Miller remained in Minneapolis while the rest of the band moved on to Chicago), the Strike finally return with Shots Heard 'Round the World. Of course it would be impossible for any band to follow up a strong release such as their aforementioned first album, but what's more important is that the politics are still as apparent as ever. This is most notable on "Communiqué," where they call for the workers to gather and rebel against their highers-up: "Listen to what I have to say/We workers gotta have our way/No time to beg, no time to pray/ The bosses we must disobey." Continuing their left-wing beliefs and pro-union rants make the Strike an important spokesmodel for the working masses. Unfortunately, their messages are carried out on anthems that could easily lose the listener's attention span by track four. 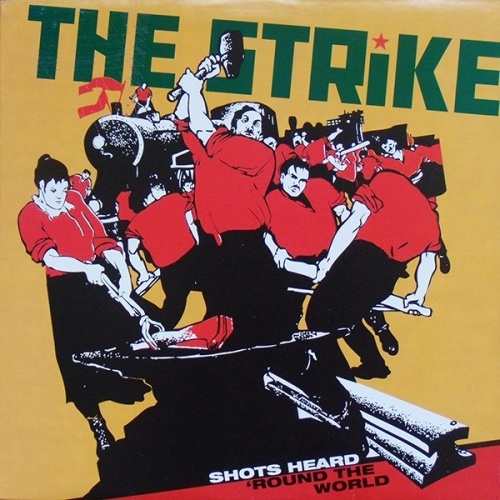 But if one could get past the occasional monotony and annoying trumpets, "Shots Heard 'Round the World" is still a decent album to fuel the angst of all the factory workers out there.